Protecting a horse’s legs effectively and correctly is a skill every horseman should perfect. No matter the type of protection it must be properly used and applied. The basic categories are: (1) wound bandages (2) standing wraps, (3) exercise wraps and (4) shipping boots or wraps. The first step is to know the differences in the outer wraps. There are basically three types: standing wraps, polo wraps and adhesive elastic wraps. Polo wraps: this wrap is soft and bulky. Its function is to protect the horse’s leg from cuts or bumps by a hind or fore foot while the horse is doing its normal work routine. It is not designed to cover a wound as the bulk makes the finished bandage too thick. Improperly applied wraps can slip, bunch, gather and constrict a tendon with the potential of becoming a “bandage bow.” A bow to a tendon causes inflammation and scarring. Bows cause at the very least temporary lameness, and even after healing will impair a horse’s ability to perform. Be careful applying wraps; don’t bandage bow a horse! When using a standing wrap to cover a wound or protect a horse for shipping apply the protective material (gauze pad, quilt, sheet cotton), then finish with the outer wrap to hold it in place. Start the outer wrap on the inside of the leg with the rolled bandage in your hand closest to the horse’s head. Take the end of the bandage and place it in the center of the inner side of the leg just above the fetlock joint. I like to start all wraps just above the fetlock joint so that I can wrap the fetlock joint first and anchor the bandage to that joint. There is little chance of pulling the wrap too tight around the joint since it is virtually all bone. 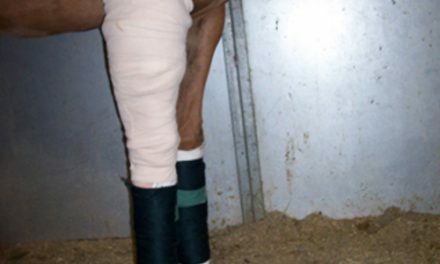 Do not wrap under the fetlock joint when using a standing bandage. Bring the roll of bandage from the inside of the leg to the outside, pulling taunt only across the front of the cannon bone. Wrap the bandage around behind the tendons and grasp the bandage again inside the leg with your hand closest to the horse’s head. DO NOT PULL TIGHT ACROSS THE TENDONS. Bring the roll of bandage across the cannon bone again inside to outside. Always wrap from the inside toward the horse’s head. This direction will help ensure you do not pull across the tendons. Wrapping so the material is “pulled across the cannon bone” and “laid across the tendon” can prevent swelling, accumulation of fluid, restriction of blood vessels and avoid creating pressure points. Always bandage the opposite leg as well, giving equal support to both legs. Never put a full bandage on one leg without putting a full bandage on the opposite leg. This applies to hind legs as well as front legs. Exercise wraps are very tricky and should not be attempted the first time without an experienced supervisor watching. Exercise wraps are most often seen on race horses, jumpers and cross country eventers. Exercise wraps do not give protection to the leg, nor do they help hold tendons. A well-done exercise wrap simply slows down the descent of the fetlock joint, helping to avoid serious pulls or tears to tendons or ripping of joint ligaments. With the many good exercise boots on the market it should not be necessary to use exercise wraps. The danger of causing a serious problem due to improper application of the wrap is great. There is also the possibility of the wrap becoming loose – tripping or frightening the horse. Likewise, there are also many commercially produced shipping boots. If you plan on hiring a hauler to transport a horse check their policy about leg protection. Some companies prefer the horse’s legs not be wrapped, as the driver will not reapply the bandages or boots. The driver may remove the loose leg protection…or not. If you decide to protect legs with boots or bandages get the horse used to wearing them before the day of shipping. Allowing the horse to wear the chosen leg protection in the stall will give you time to see how they fit, if they stay on and how the horse reacts to having something on his legs. Poorly made or poorly fitted commercial shipping boots can become loose, allowing them to slip and slide off. Many people who transport horses will only protect the front legs. It is possible if the horse urinates in the trailer the wraps or boots can become soaked in urine. This could lead to scalding of the skin, kicking or stomping because of irritation. Don’t let leg protection cause a problem – know the wraps and how to properly apply them. 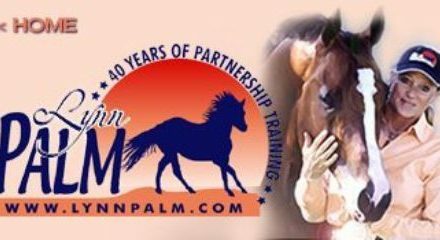 * Take the online course “Stable Management”. 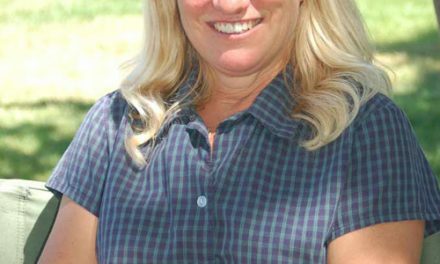 Earn certification or work toward a Bachelor of Science degree in Equine Studies. 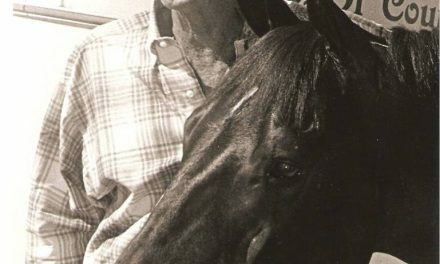 Go to www.horsecoursesonline.com for more information.